This post is to give information to my Alaska Math Consortium classmates and teachers. In the first two videos, we have the data collection via digital infrared thermometers and a video. 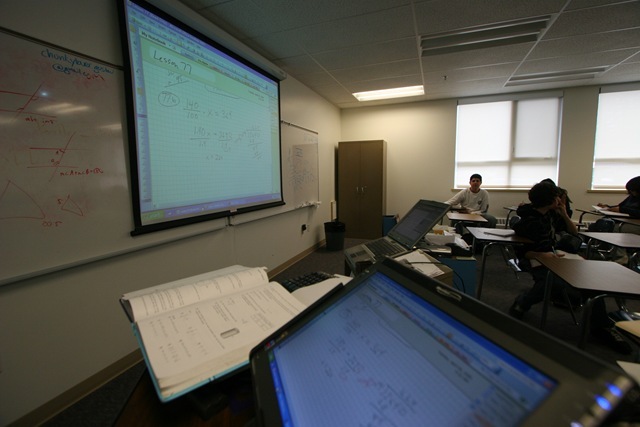 In the second two videos, the calculus students present their equations and graphs of their results to the class. To gather your own data from the videos, make a table of values, then start in! This is a short video and the paper drops from 176 degrees to 75.5 degrees in about 2 minutes. Video is spliced together from 4 videos and is quite long. One would want to pick an interval to use like, say 5 minutes. (very long: 56 minutes!) Turns out, a cup of water takes much longer to cool down than a piece of paper. Chris & Blake do a rap up. The battery on the camera died before the end. Chris and Blake do a find job in this video. Unfortunately, the battery died before the end of their presentation. Hunter and Abby do their presentation. Abby and Hunter have a nice wrap-up here. As we relaxed around the house tonight. Holly and Mark got ready for the annual 100th day of school celebration that the Kindergarten holds every year. Before we knew it, Mark was sitting there counting by tens. My Class notes are online again! Yipee! I guess Ken fixed my web-site a few weeks back, because the web-site he gave me a few years ago is working again! the web page, in Internet explorer 7 anyway, looks almost exactly like the pages in OneNote that I write in class. I host my notes and my old wedding album samples there. CLICK HERE!! to see my notes page. Drop me a line if you have any problems loading the page and tell me what browser you’re using, what type of connection you have, and any other pertinent information you can think of. The pages don’t load SUPER fast, but reasonably fast for DSL, which I have at home, and there are no click-able links plus the backgrounds with the graph paper is not visible, but hey, at least the assignment sheets are there and the problems are there worked out. Notes close-up: see below. I’m just excited that the web page is good again. 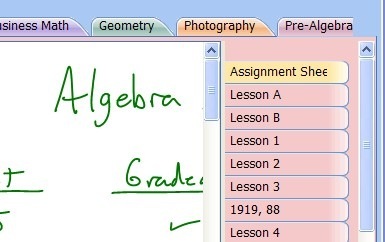 Students can click on their class along the top, then select either the assignment sheet or the appropriate lesson on the right. PLUS, since the web-site was working, I was able to get a gig shooting a wedding down in Sitka in April, as Mother-of-the-Bride was able to view my album on the web-site. Whether you’re for him or against him. 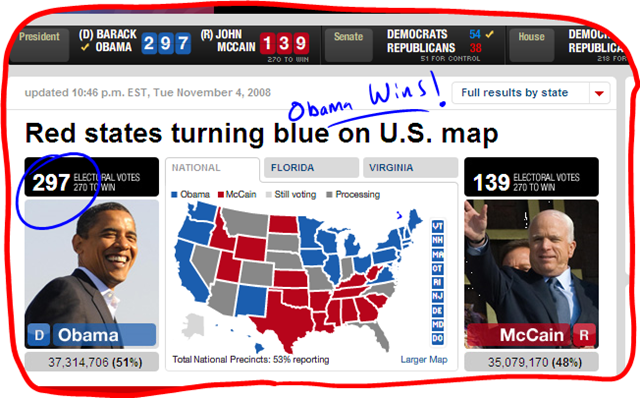 It looks like Obama is going to win. This is my first glimpse of the results, after coming to school to grade some tests. 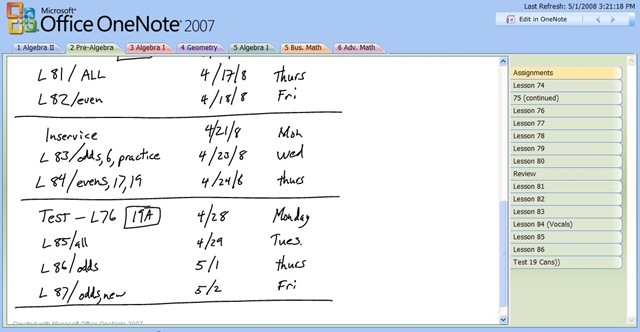 My MS OneNote 2007 Class Notes are online! I’m so excited about it, I can NOT believe it. One of my goals for technology in my classroom this year was to get my class notes and assignments all online on a daily basis for my classroom. For me, this was a big goal, because math text is notoriously difficult to handle on the web without using a lot of mouse clicks and specialized software. Thanks to Ken Heiret (Holly’s Brother-in-law), I now have the notes uploaded to my folder on his server and viewable to the world. This is so exciting, I can’t believe it. I’ve wanted to do this for about 2-3 months now, and I finally got it done. Here’s the link: CLICK HERE!!! It looks like this, if you follow the link. One of the things that strikes me almost immediately, is that I need the opening page to be compelling and more general for people that might find the site that aren’t my students. I’m think there could be an introduction page that has general facts about me and perhaps a picture or two of my classroom and the school. The tabs down the side are links for the “Assignments” and the “Lesson Notes” for particular lessons. I really like the interface in many ways. 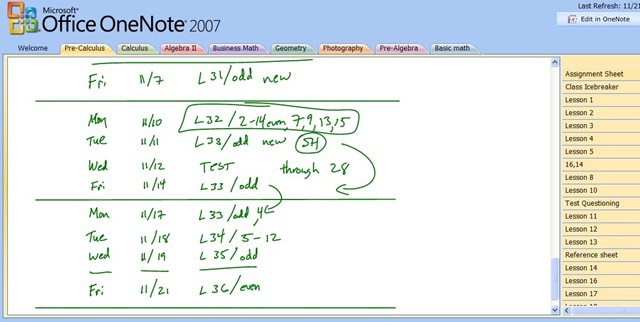 It’s really easy to find the notes for any day in class for any lesson and they are automatically filed by date. notes to mhtp files, then I upload them to the server. The whole process of getting the notes online takes about 20 minutes at the end of the day and a few mouse clicks. I access the server using Windows Remote Desktop. 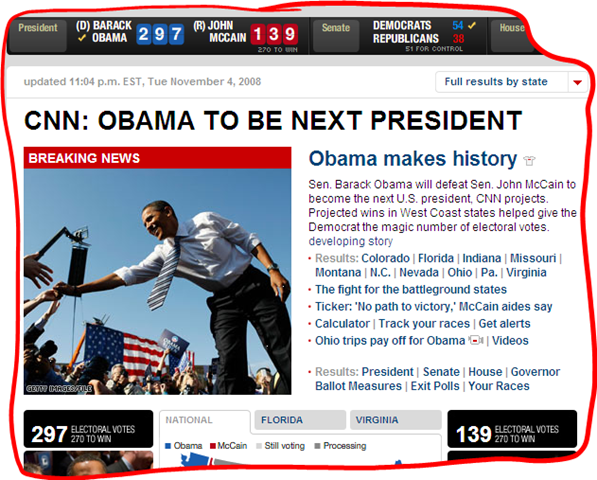 The notes are viewable by anyone using Internet Explorer 7 and connected to the Internet. Students can visit the page to find the assignments for the week or look at the notes in that have been given. if the graph paper background was also uploaded with the files so that it would appear under the notes, just like it does in class, that would improve the look of the graphs. 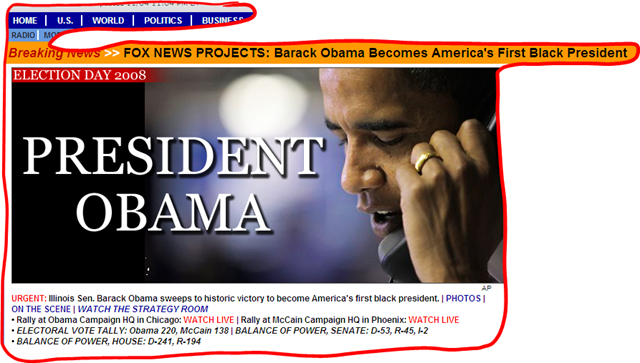 If I could imbed web links in the pages, that’d be wonderful for making links to web resources. If there were some way to make the site interactive without requiring a purchase of OneNote, which is unavailable for Mac. More than half my students use Mac laptops and almost none of them have OneNote. If my handwriting were better, then the pages would look better. If the files uploaded were a bit smaller, then the pages would load quicker. If the files would be viewable on Safari and Firefox, then all the students could view them. I’m sure there are workarounds for this, but I don’t know what they are yet. It’d be nice if I could replace the big ad for OneNote 2007 with a .jpeg of me in my classroom, or of the school, or some other picture. Right now the pages that are uploaded are all .png files, which are compressed image files, and have about the same resolution as a standard FAX–not the greatest, but legible. One workaround for getting the graph paper would be to put an image of some graph paper on the page I’m writing on and then do the graphs on the image of the graph paper. For now, I’m simply making the graphs a little more detailed than I might normally do since by putting in more of the coordinates for the points along the x and y axes. As soon as I got it done, I was on the phone with Jack and he was trying to view the notes and he couldn’t because he was not using Internet Explorer 7. I like using MS Office’s OneNote to write, store, and organize my notes in class. Here’s a screen shot of the program. You can probably just barely see the colored tabs across the top that say Algebra II, Pre-Algebra, Algebra I, Geometry, 5th Algebra I, Bus. Math, and Adv. Math, but those are the tabs for the class notes for each of those classes. Then along the right-hand side of the screen, you probably can’t see what the tabs say, but they say, Assignments, Lesson 75, lesson 76, lesson 77, etc: these are the tabs that lead to the assignment sheet and the notes for those lessons. This is the way I used to organize my notes in school (except that there were pages I tore out to turn in to the instructor or professor). Here’s a picture taken from right near where I usually stand in my classroom which includes the tablet in the lower right corner and the screen at the front of the room. I really like this program MS OneNote and how it simulates a notebook, but saves everything in an organized fashion that I’ve written and allows me to display it all for the students to see, and print anything out for them as well. If a student is absent, I can just print out the day’s notes and the assignment sheet for him, or her, by hitting print and the notes go to my personal, 21 PPM Network Printer (HP 4100), which duplexes, at the back of the room (which I bought four years ago for $500). Of course, what makes this all possible is that we now have digital projectors in each class and brand new 5’x7′ screens to project onto. If you’re a teacher, and don’t have a projector yet, start squeaking and get one of these projectors. 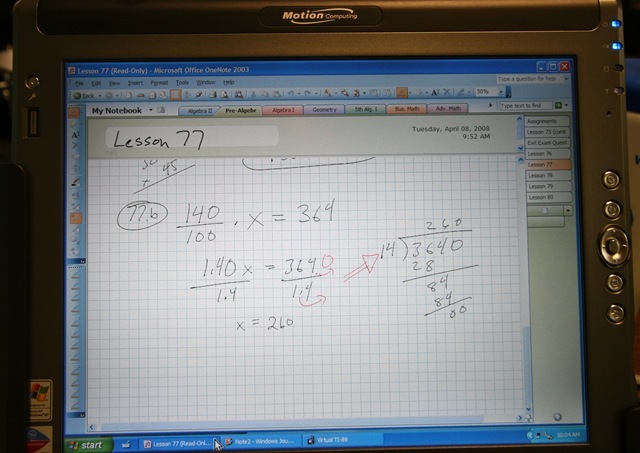 It’s much better than using the overhead projector or the whiteboard. I’m storing my old overhead projector in the brown closet in the corner, incase some of this hi-tech stuff goes down. I just called Motion Computing and told them my serial number (by going into the bios) and they said they’d send me the recovery CDs right away by next day air. They haven’t arrived yet, but I am very impressed with their customer service department. I don’t need them at this point, but may need them at some point in the future. My LE1600 has a 30gig HD and 1.5GB of ram. I just upgraded the memory from 512MB and am going to start searching for a hard drive imaging program that will allow me to image the 30GB HD over to a 60 or 100 GB HD. I’m going to be getting OneNote 2007 in the mail any day, and then I’m going to start actively looking for a way to transfer these notes to a shared spot online using Microsoft’s SharePoint server software (I think that’s the name) then the students in the classes can access the day’s notes and the assignment from the Internet.